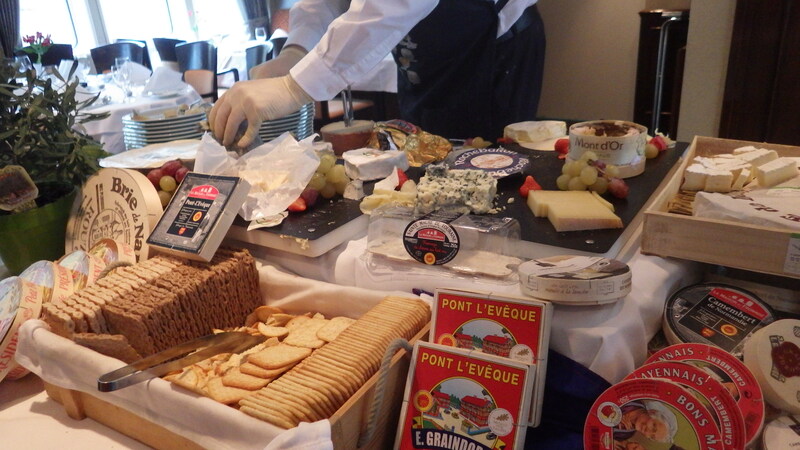 We totally enjoyed this recent trip with our club members to the cheese caves of France, hope you will too! 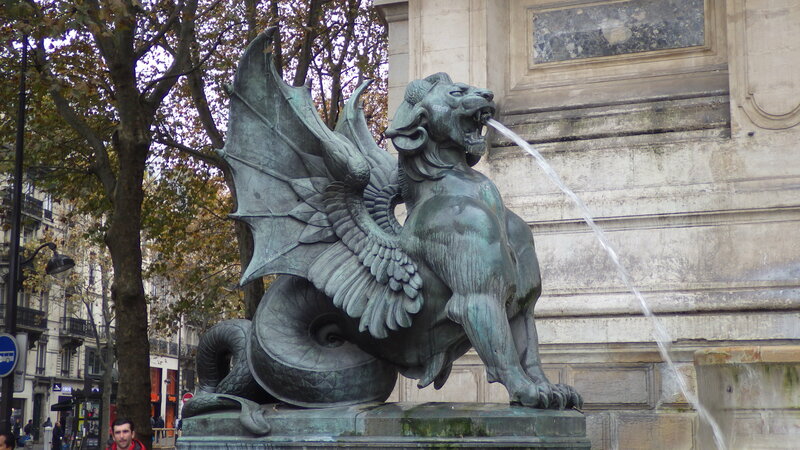 Day 7 – Last Day on the Seine! 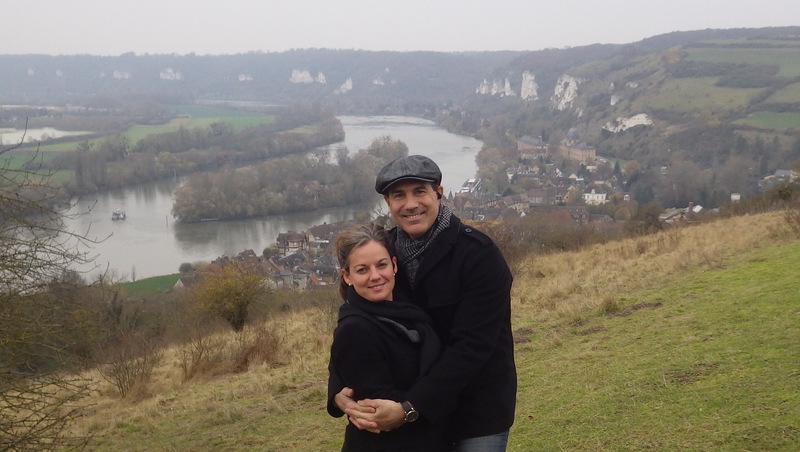 We are back in Paris for the final leg of our Celebration of Wine Cruise on the Seine! 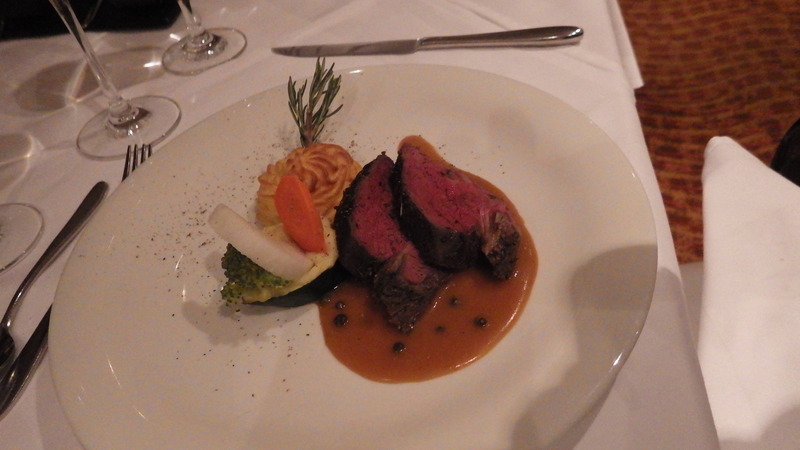 Last evening we dined at the Chef’s Table specialty restaurant at the ship’s stern. Chef prepared chicken carpaccio with tuna – basil cream, pan fried salmon with sesame – lavender crust and porcini salsa, grilled lamb rack with herb mash potato, rijta, and broccoli, and a dessert honoring the apricot – a spoonful of apricot sorbet in a waffled caramelized crepe, an apricot pastry dumpling, and a shot glass of Marillen liqueur! 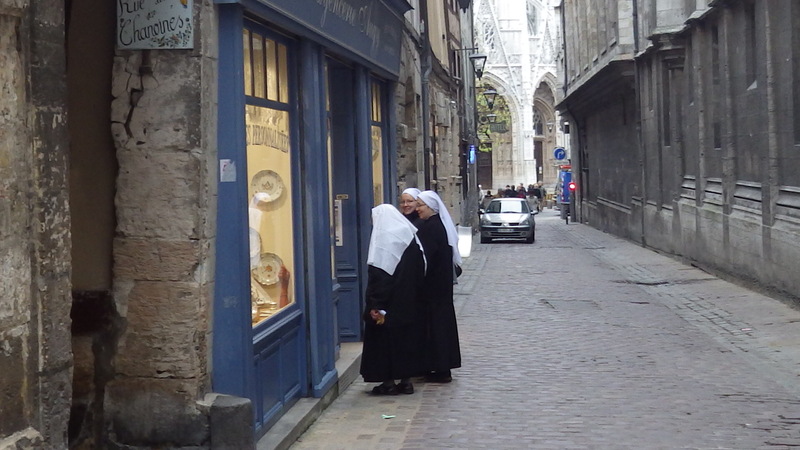 Today’s excursion explored the Marais neighborhood of Paris, featuring remnants of the ancient wall of Paris, the mansions of the French nobility, and the traditional home to Paris’ Jewish population. 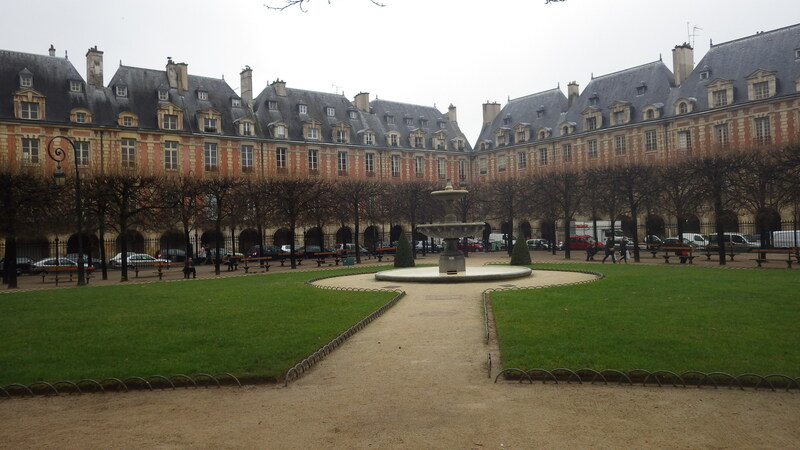 We strolled through the Place de Vosges and visited its art galleries and cafes. 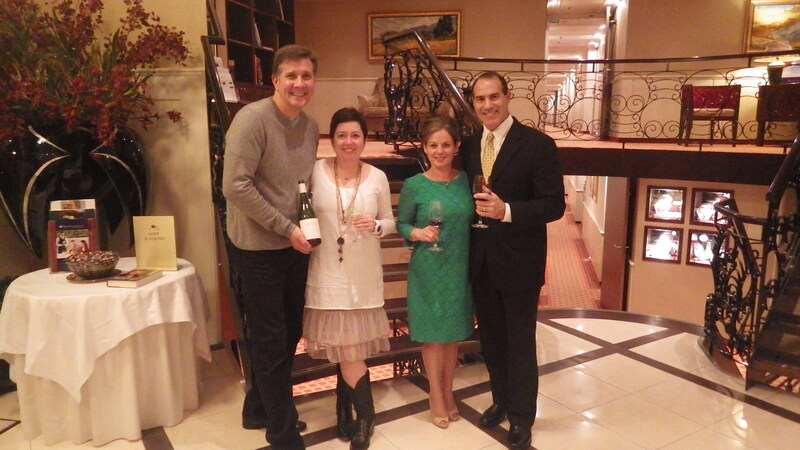 Once back to the ship, we enjoyed a Champagne tasting with Preston Mohr, learning about the Champagne region of France, levels of sweetness in Champagne, and the difference between vintage and non-vintage Champagnes. Did you know that vintage Champagne takes less effort to produce than non-vintage because vintage Champagne is supposed to have a unique taste, while non-vintage must have a consistent taste year after year, even though grapes are used from different growing years? Tonight Chef prepared a special Thanksgiving entrée of turkey meat, prune stuffing, French crosne, beet root, carrot mash, and cider sauce for the American passengers as well as a scrumptious cream of pumpkin soup. After dinner, Belgian classical artist La Strada performed in the lounge, delivering a beautiful collection of stringed arrangements with their guitar and violin. 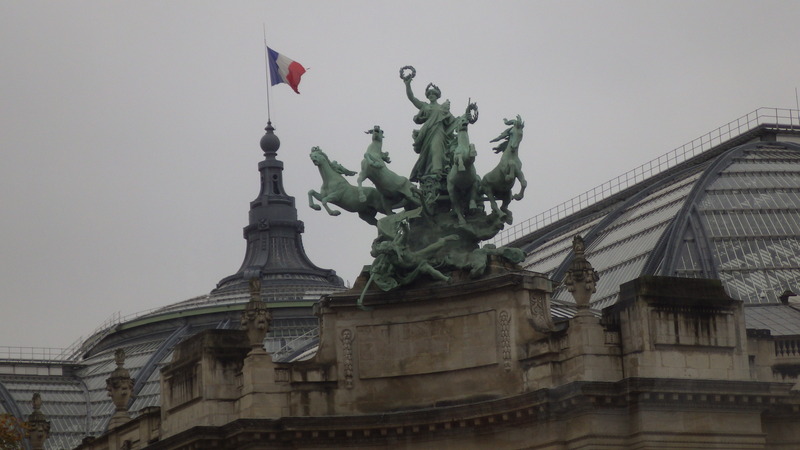 We spent our additional free day in Paris taking in the exquisite artwork of Monet, Cezanne, Renoir, Rousseau, Picasso, Matisse, Degas, Manet, Redon, and Rodin at the Musee d’Orsay and the Musee de L’Orangerie, and exploring the sights and sounds of Montmartre. 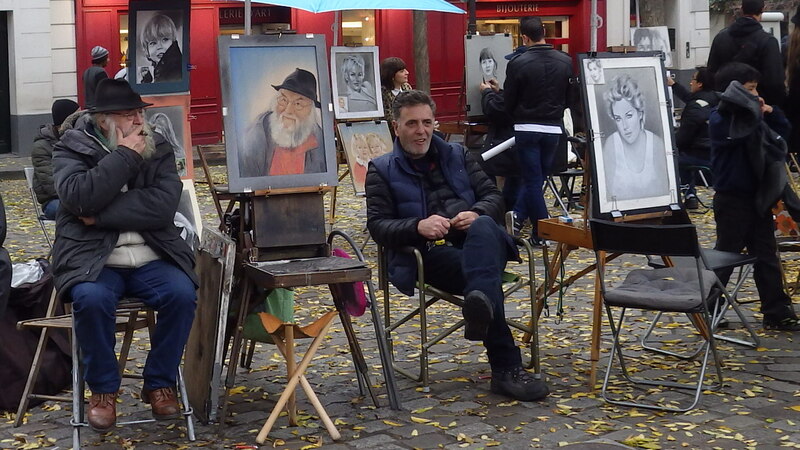 Montmartre is a fascinating area of Paris, featuring the Sacre Coeur Basilica, the Moulin Rouge, and many art galleries and cafes. 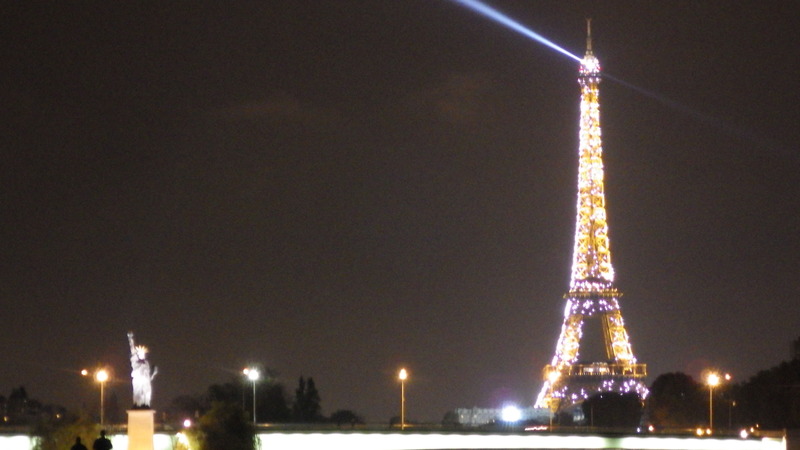 We saved the grand finale for last, ascending to the very top of the Eiffel Tower after dinner that night! What an incredible view of the romantic City of Light! 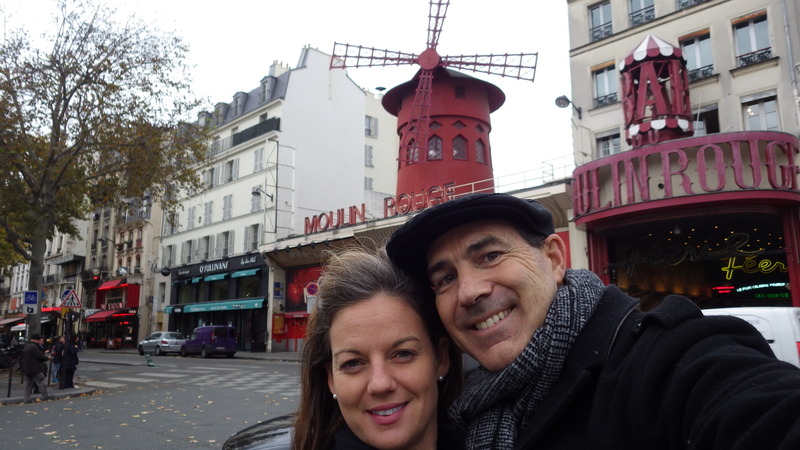 As difficult as it is to say au revoir to France, we are anxious to return to our family and friends in North Carolina and at Winestyles. We have made many priceless memories and some new friends as well. 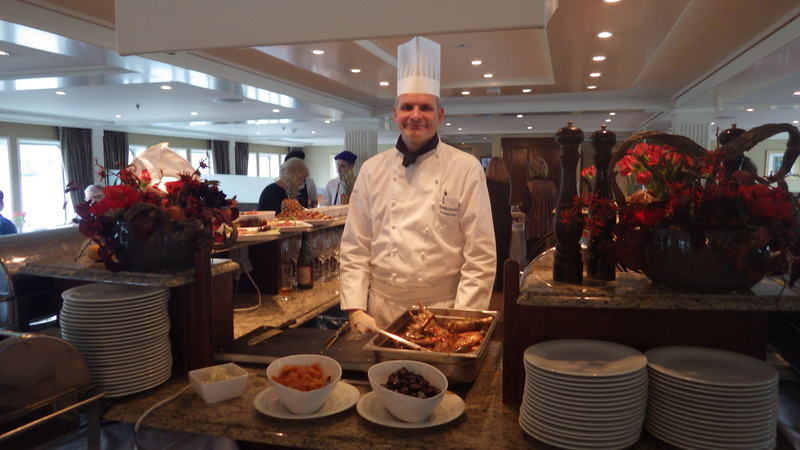 We cannot say enough about our AMA Waterways experience – the service, attention to detail, caring attitude of the crew, the exquisite food and beverage, and the overall accommodations aboard AMALegro have been top notch. 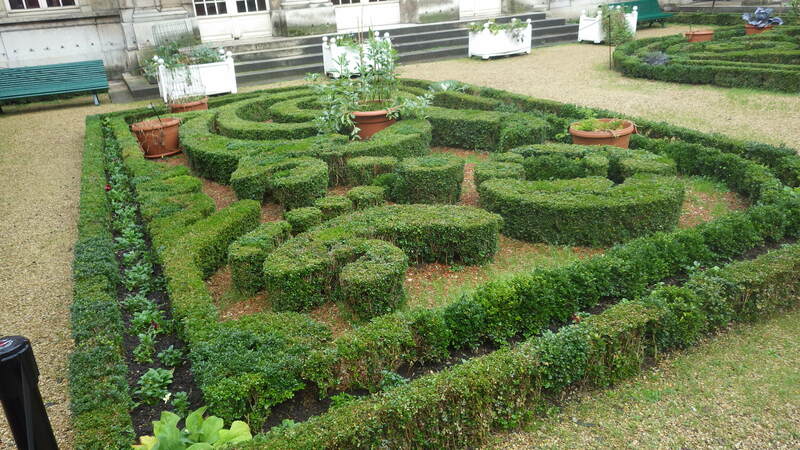 One of our fellow passengers summed it up well when she said “every day has been both enjoyable and educational”. Thank you to our Trinchero wine hosts, Barry and Kim Wiss, who have also been gracious in sharing their experience and knowledge. What a terrific way to experience a country – there is substantial truth in the statement “an ocean cruise takes you to a country; a river cruise takes you through a country”! 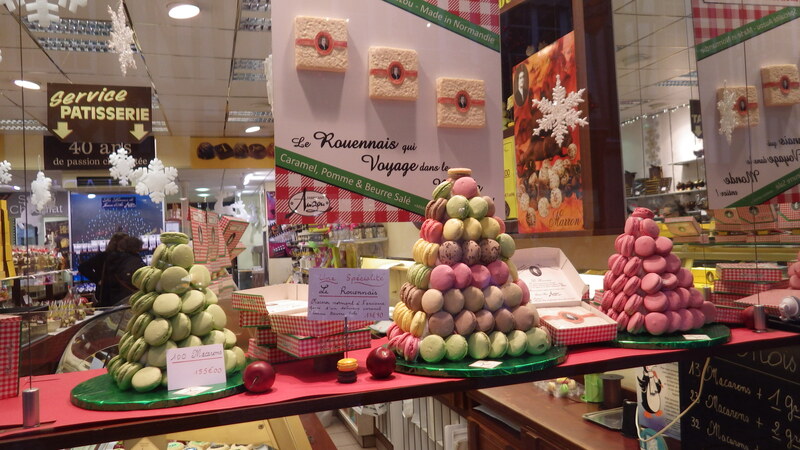 Day 6 – Cruising on the Seine! 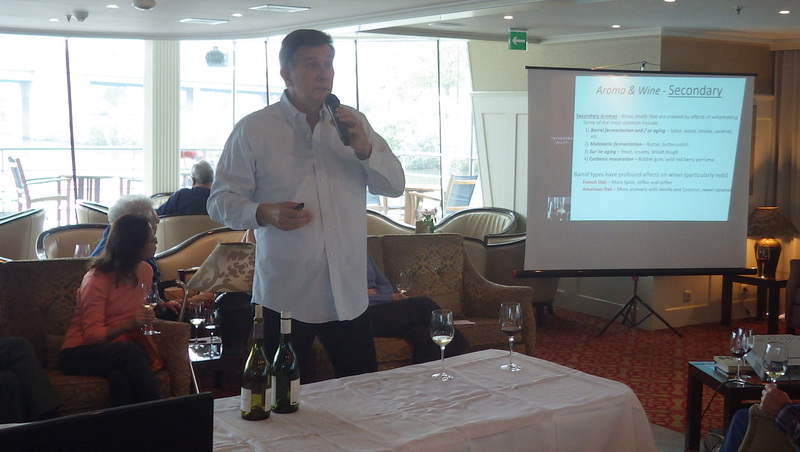 Day 6 on the Seine began with another informative wine education presentation by Barry Wiss. We learned of the humble beginnings of the Trinchero family in Napa and its continued dedication to responsible agribusiness, producing wine using biodynamic practices to conserve energy, recycle, and re-purpose by-products. Barry also explained how to read French wine labels, from discerning AOC from AOP to which varietals are affiliated with Bordeaux and Bourgogne. Finally, we played “What’s Your Wine?”, and learned that the true parent grape of Zinfandel is not Primitivo from Italy but Crijenak Kastelanski from Croatia! Afterwards, Chef treated us to a Normandy Lunch, celebrating the various dairy, apple, and seafood products indigenous to the region. All week we have witnessed our Hotel Manager Markus return from the villages with a smile on his face and his arms full of fresh produce, shellfish, and baked goods! Bon Appetit!! 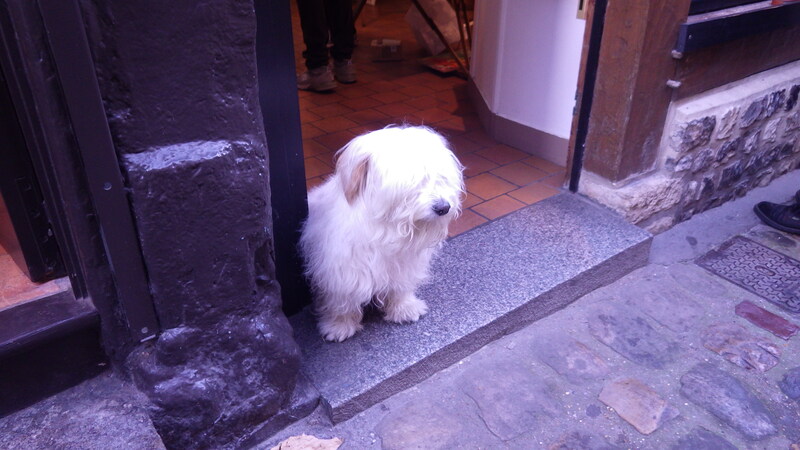 Our afternoon excursion took us to the cobblestone streets of Les Andelys, made up of Grand Andely and Petit Andely. 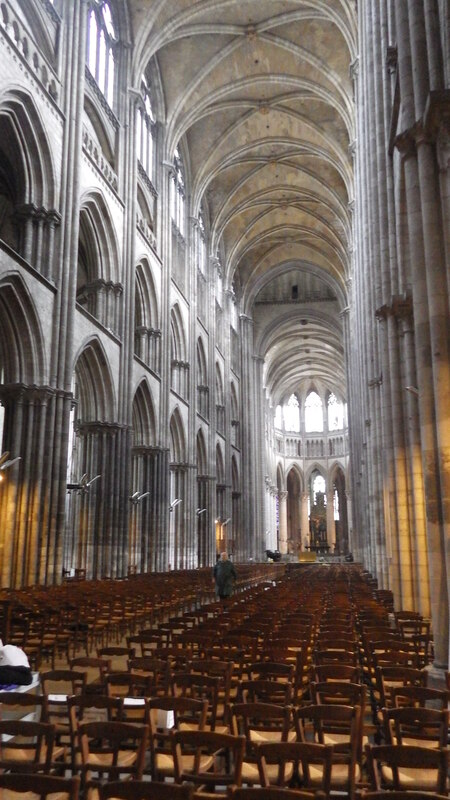 In Grand Andely, we toured another Cathedral of Notre Dame, this one built for the queen in the 14th century. 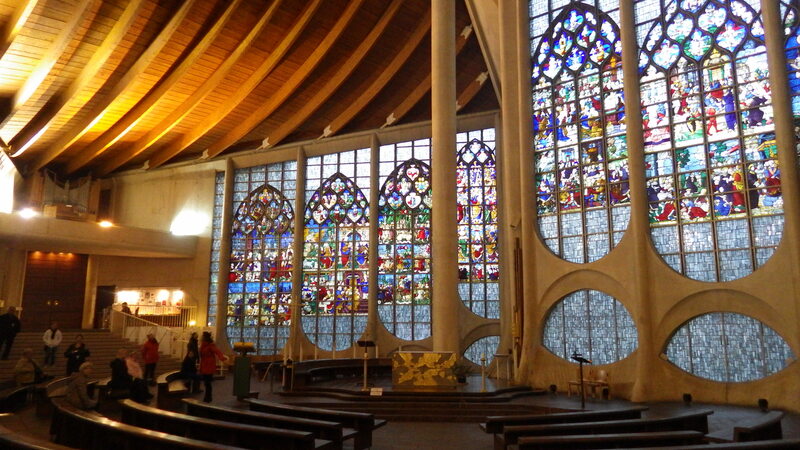 The stained glass in this cathedral is nothing short of spectacular! 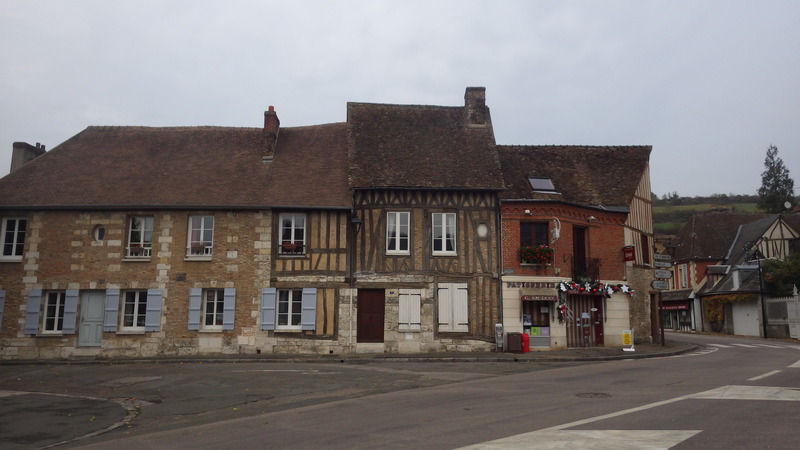 Les Andelys is a picturesque mosaic of early Norman architecture, idyllic natural scenery, and the sensory delights of a cozy French village. 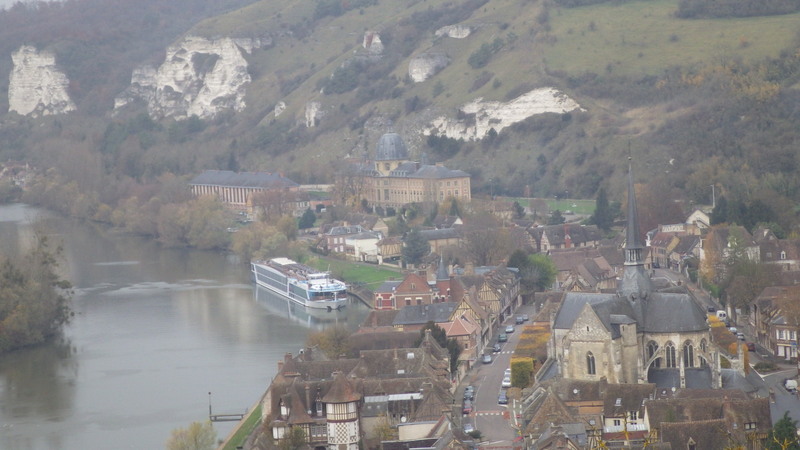 High above the village lie the ancient ruins of Chateau Gaillard, a castle built by Richard the Lionheart in 1198 to protect Rouen and the rest of Normandy from King Phillip II and the French. 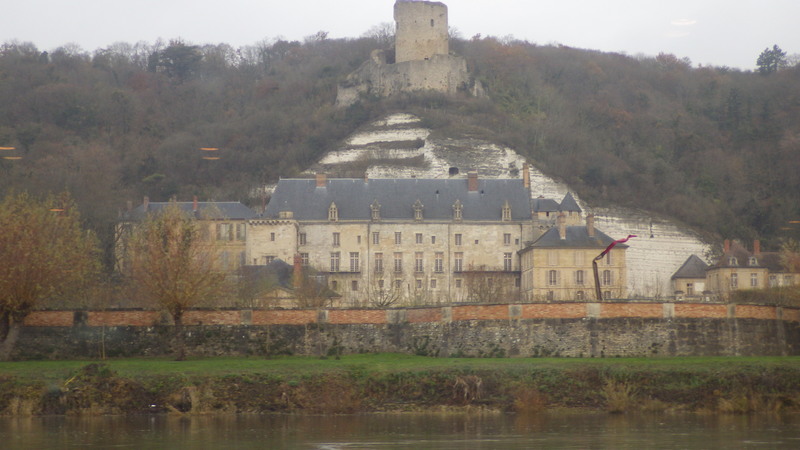 Hewn from the chalk white limestone cliffs that adorn the river valley, Chateau Gaillard was the strongest fortress of its age. 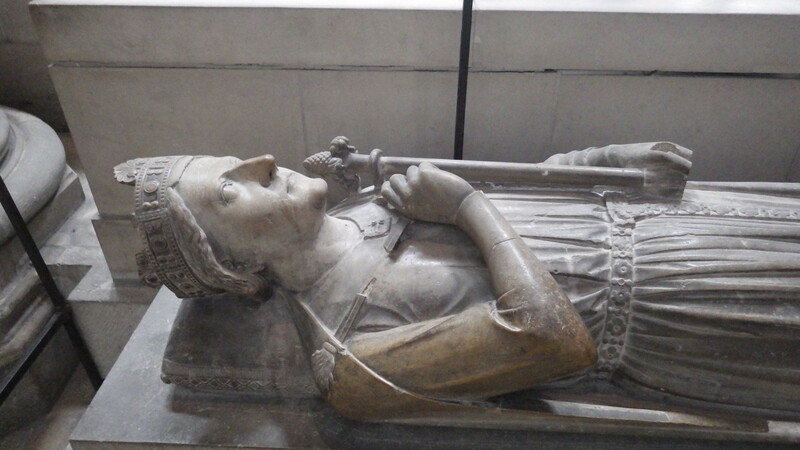 After Richard’s death, Phillip finally laid siege to the castle and captured it in 1204. 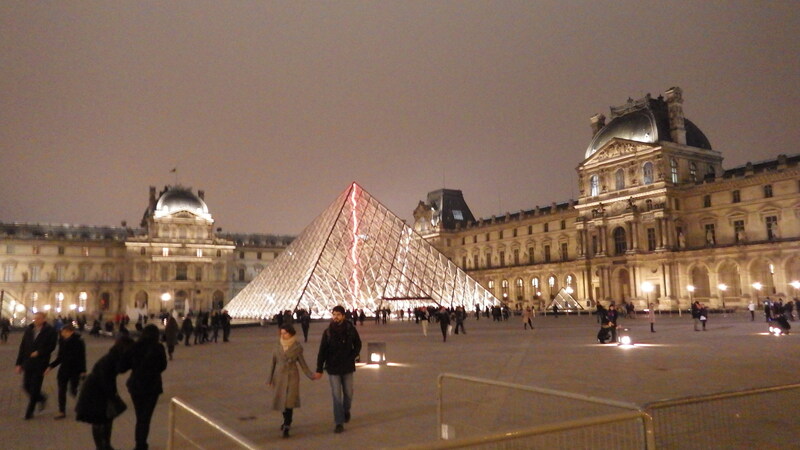 It became a French historical monument in 1862. Day 4 & 5 on the Seine! 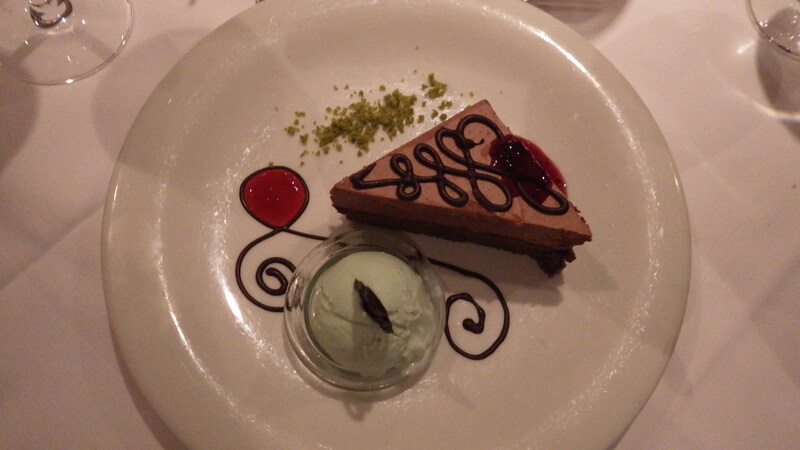 Wow, what a dinner last night – poached chicken with capers and tuna sauce, deep fried Camembert, and chocolate mousse tart with pistachio ice cream and forest berry sauce! 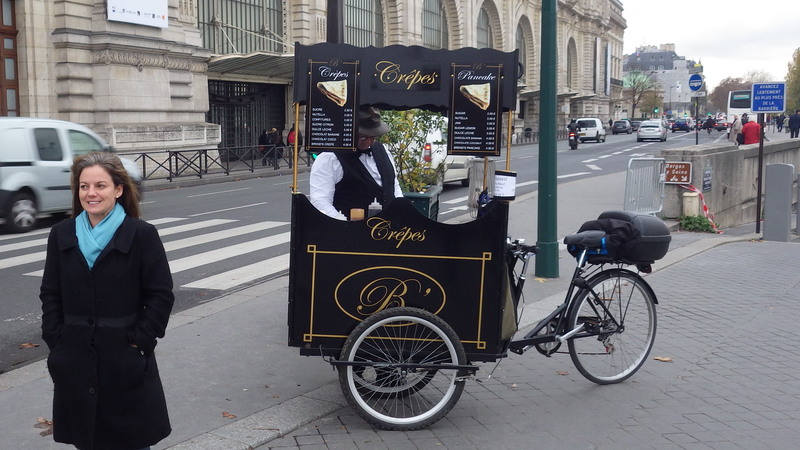 Le chef du AMALegro est fantastique et la cuisine est extraordinaire! 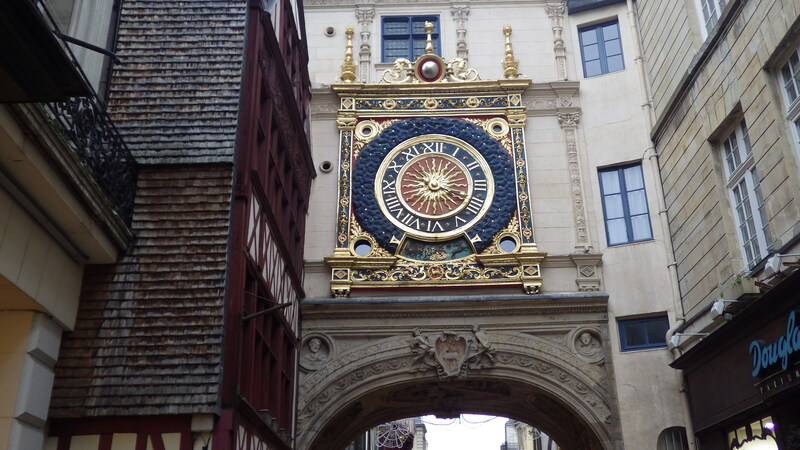 Today we are in Rouen, another Normandy destination full of history and old world charm! 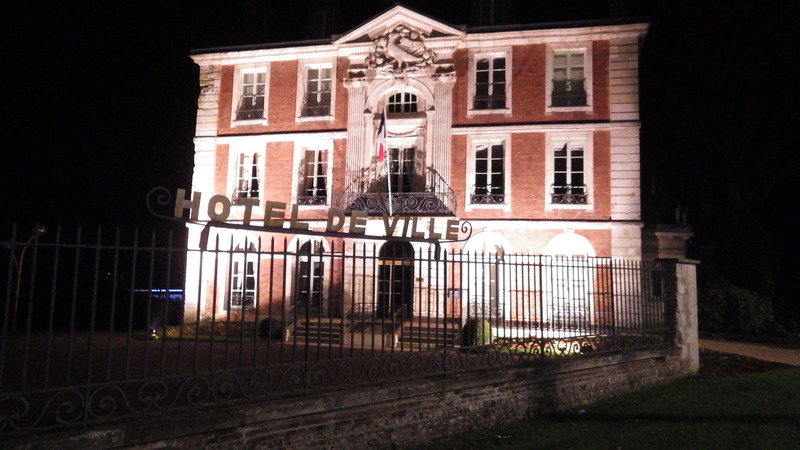 It seems that in every sizable French village and city, the Catholic Church has built a monumental cathedral honoring her first lady. Originally constructed in 1125, Cathedrale Notre Dame de Rouen features breathtaking interior beauty as well as intriguing history. We learned that during the World War II bombardment of Rouen, several allied bombs fell astray and significantly damaged the cathedral. On one side, a bomb took out six of the eight flying buttresses designed to support the main structure, but left the shrine to Saint Catherine intact. 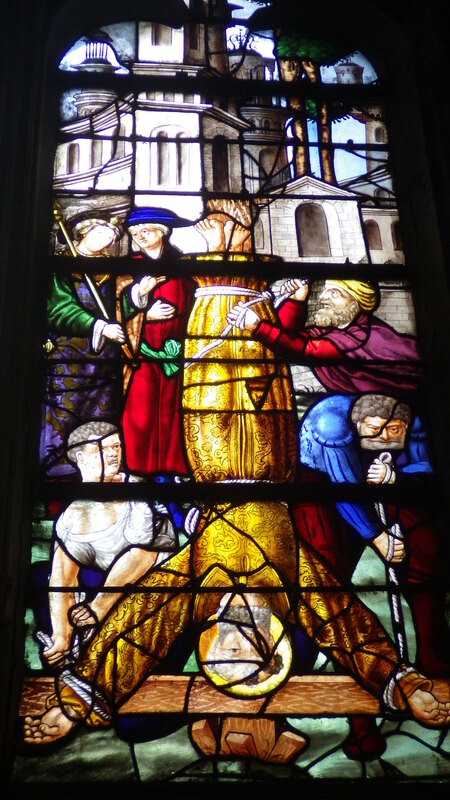 The fact that the entire cathedral did not buckle and fall is referred to as the “Miracle of Saint Catherine”. We also viewed the tombs of Rollo the Viking Warrior (Robert I) and Richard the Lionhearted, the first and last Dukes of Normandy. 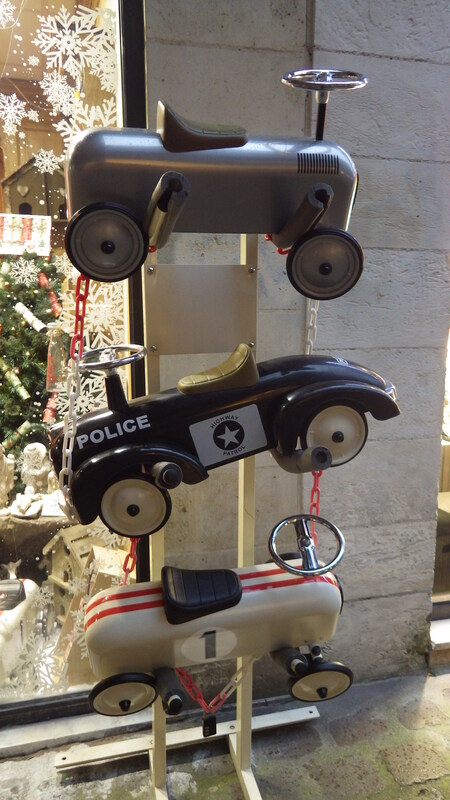 On a more secular note, the cobblestone streets of the city were bustling with early Christmas shoppers and lined with a mixture of local artisan and high-end Parisian brand shops decked out for the holiday season. 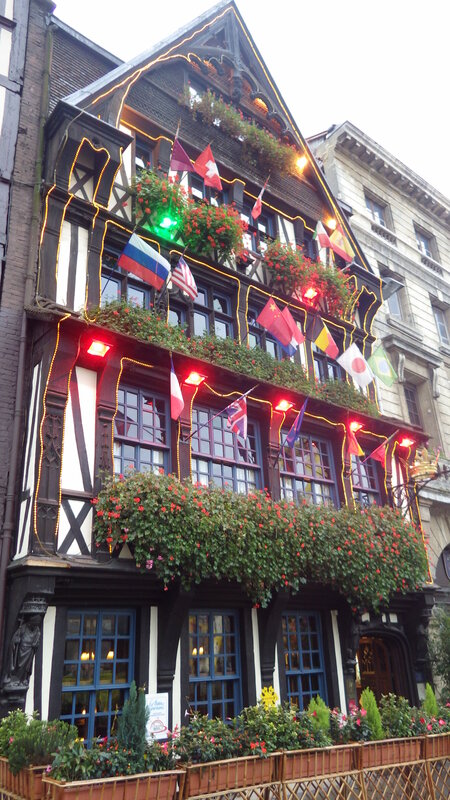 On the square of Joan of Arc is La Couronne, the Michelin 3 star restaurant where Julia Child got her inspiration to produce her famous cooking show. 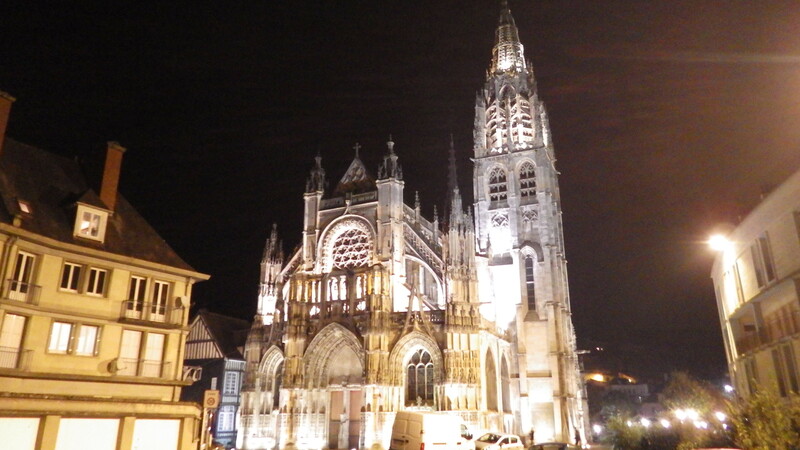 We also viewed the monument commemorating Claude Monet’s visit to Rouen when he included Notre Dame in his series of cathedral paintings, as well as the former brothel from which he painted it! At the cathedral is the court in which Joan of Arc was tried and sentenced to death by burning. This brave young woman, “called by God” to lead the French in battle to resist the English, entered the king’s army disguised as a boy at the age of 16, led the French in numerous victories, was captured by the English, burnt at the stake in Rouen in 1431 at 19, and eventually canonized a saint of the Catholic Church in 1920. We visited the site of her execution and the unique church built there in her honor. 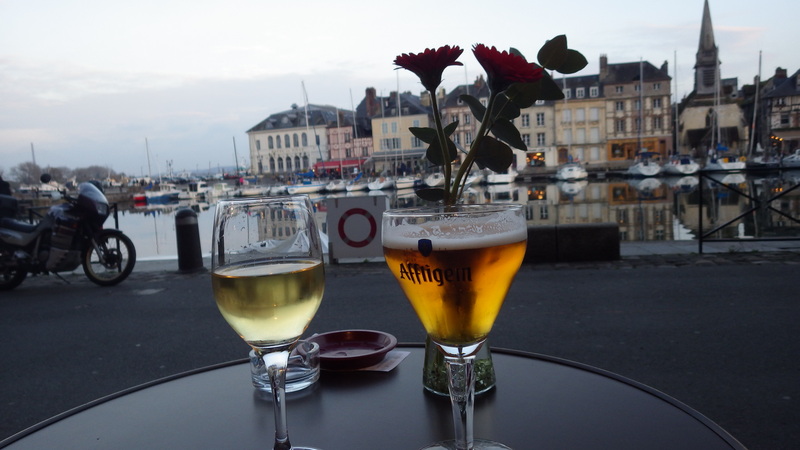 The French love their beer too! Upon return to the ship we were greeted by Capt. Franck with a champagne toast at the traditional Captain’s Dinner, which featured five courses with accompanying California wine pairings from Trinchero Family Estates, including a Napa Cellars Sauvignon Blanc and Cabernet Sauvignon, a Folie a Deux Chardonnay and Pinot Noir, and a very nice dessert compliment, Terra d’Oro Zinfandel Port. The meal was delectable, featuring French truffle-goose liver pate, cream of fennel soup with poached Atlantic sea bass and Pernod, and “Medaillon d’Agneau Mont Saint Michel” (a wonderful lamb dish). 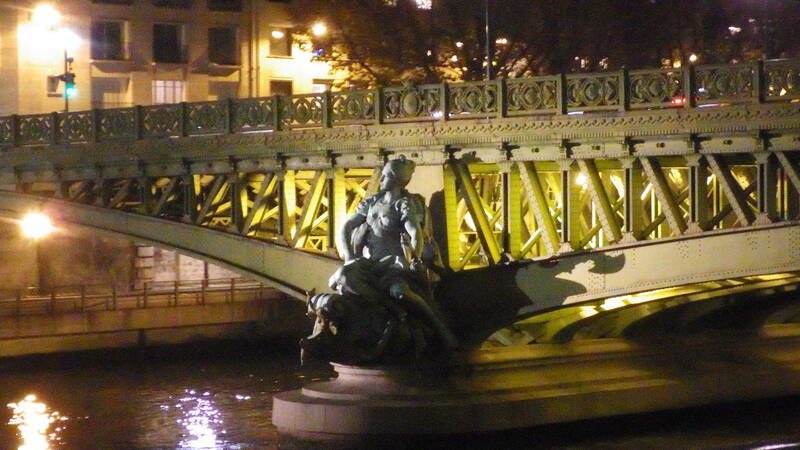 Day 3 – On the Seine! 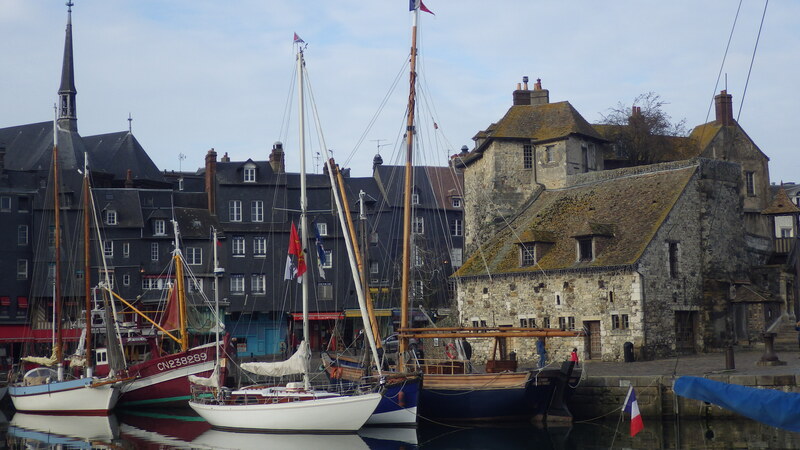 Honfleur certainly lived up to its reputation as a picturesque seaside village! 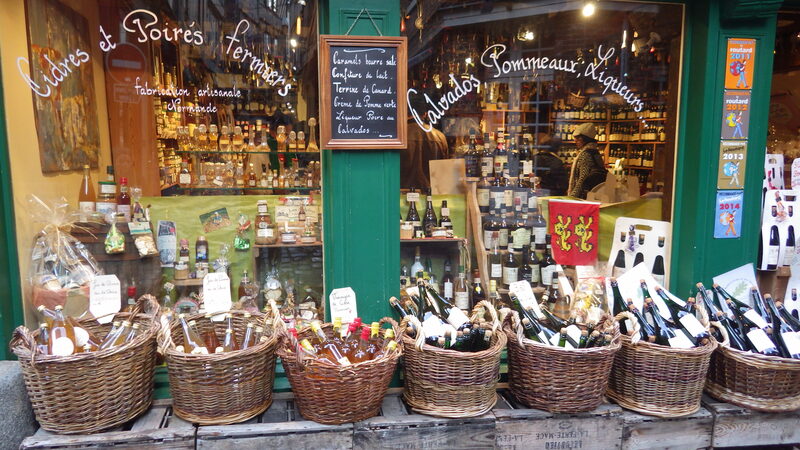 Narrow medieval cobblestone streets jammed with shops selling Calvados, Pommeau, artwork, antiques, clothing , and other local artisan products, and cafes serving crepes, pastries, wine, beer, and “fruit de mer” – fresh local seafood. The tiny harbor is home to an active fishing fleet of 15 boats, and fresh oysters, mussels, shrimp, turbot, and sole is harvested daily. 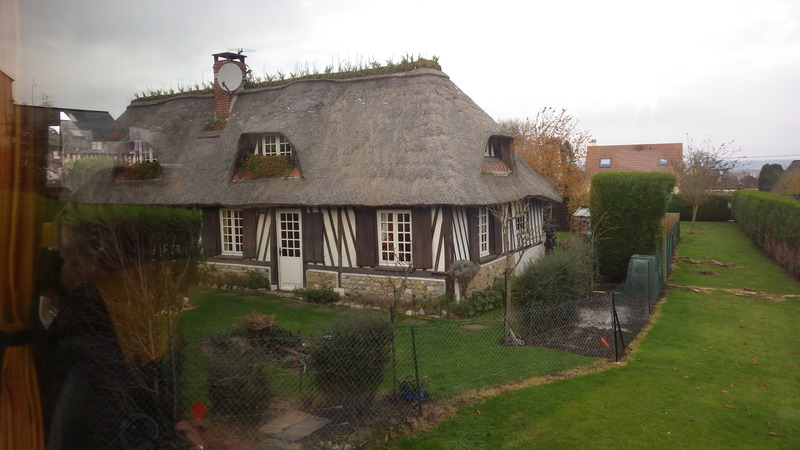 The bus ride to the coast brought us through the Normandy countryside, resplendent with its small family farms, Norman cows, sheep, quaint stone-hewn chateaux, and traditional thatch-roofed cottages. Our dinner last night featured Chateaubriand and Crepe Chanterelle, Bourgogne Aligote (vin blanc), and Valle des Oliviers Cotes du Rhone (vin rouge). We capped the day with a competitive game of music trivia in the piano lounge. We had no idea that Charlie Chaplin wrote “Smile”! 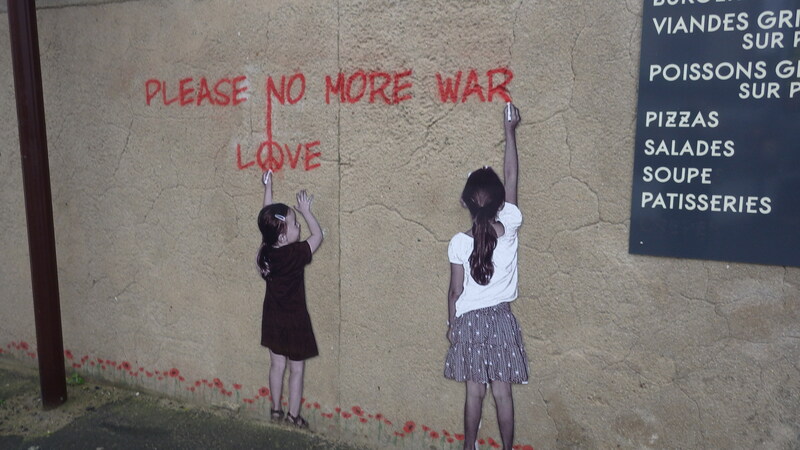 Still docked in Caudebec-en-Caux, Sunday featured a very special excursion by bus to the Normandy D-Day beaches. 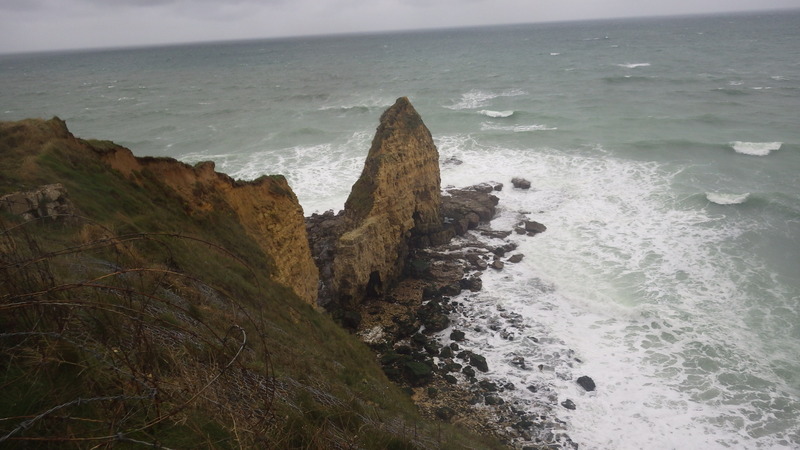 Our guide provided a terrific history of World War II, the occupation of France, and the allied invasion on that fateful day in June of 1944. 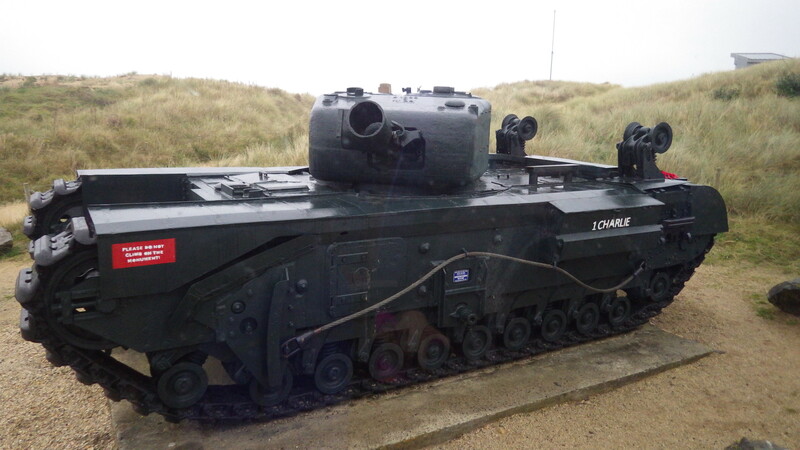 This year marks the 70th anniversary of the event, and the tour of the beaches, battlefields, memorials, and museums was both awe-inspiring and sobering at the same time. 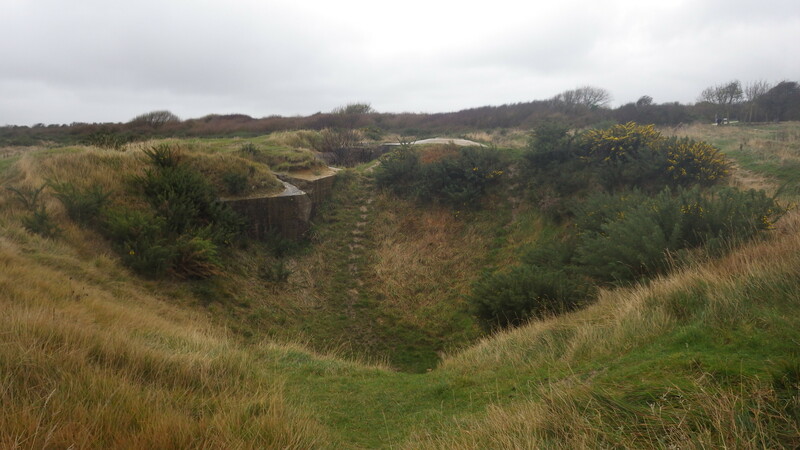 At Pointe du Hoc, we explored bunkers, bomb craters, and viewed the sheer cliffs and rocky coastline where the American Army Rangers scaled the cliff walls to engage the Germans to destroy their biggest guns. 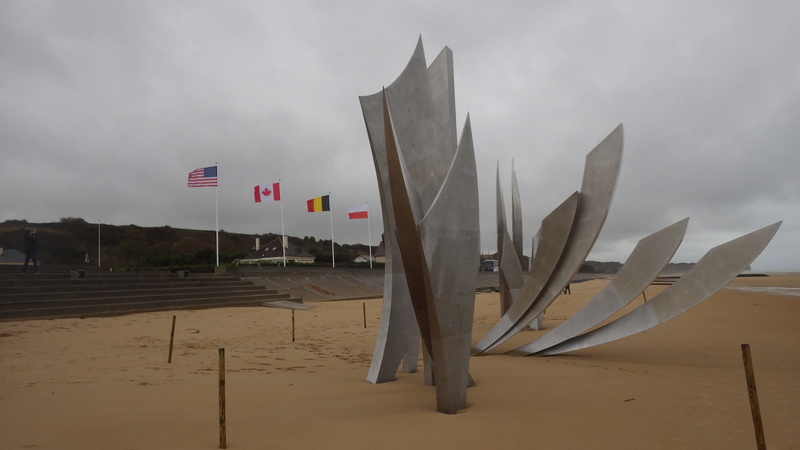 Of the 250 brave young men who landed there, only 90 survived to fight the next day. At Omaha Beach, we collected some sand from the battlefield where so many GIs sacrificed their lives for liberty and freedom from tyranny. 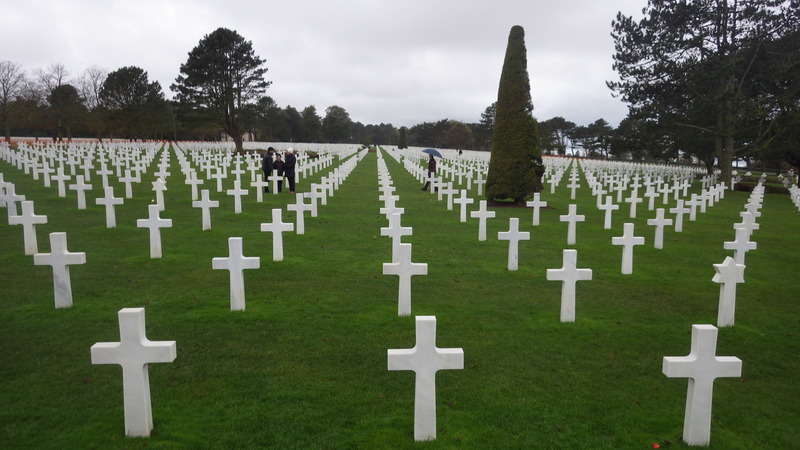 We ended the day at the American cemetery just above the beach, where we visited the graves of nearly 10,000 of the more than 22,000 American servicemen who were killed during the campaign, and toured the museum dedicated to their valor and courage. 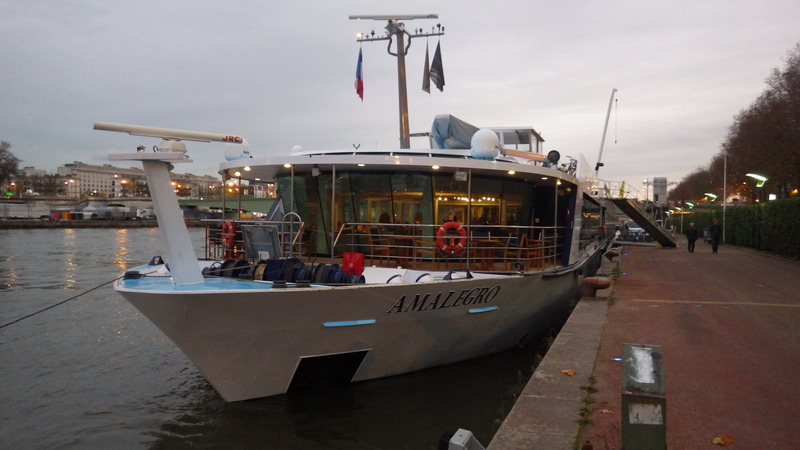 The AMALegro will set sail tonight for Rouen, the first leg of our return voyage to Paris. 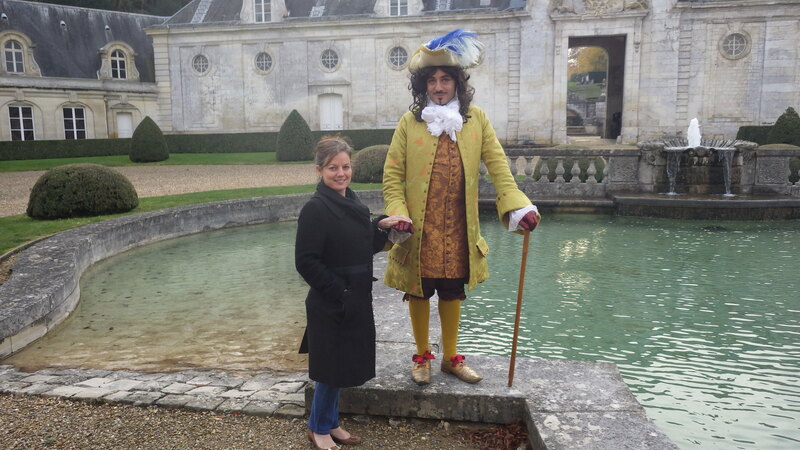 Our visit to Chateau Bizy yesterday gave us a royal taste of French nobility, as well as a taste of one of Normandy’s most celebrated products, la frommage! This historic chateau, designed as a miniature Versailles, has been the home to generations of the Suchet family, descendants of Napoleon Bonaparte, who still live in one of its wings. 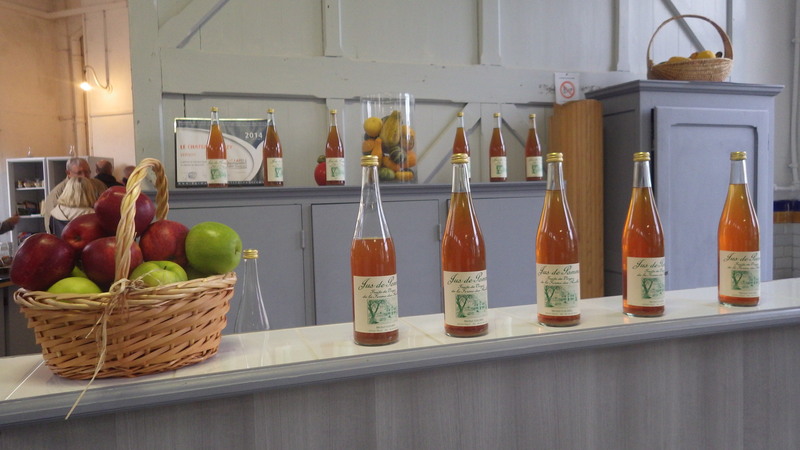 We enjoyed several workshops within the estate, including one on apple cider, which is an alcoholic beverage in France, and another on the four world-famous cheeses indigenous to Normandy; Neufchatel, Pont L’Eveque, Livarot, and Camembert. The cheese is prepared unpasteurized, as is customary within the province, and tasted fabulously unprocessed! We even had an unexpected visit from the flamboyant King Luis XIV, or was it just his ghost? On Saturday morning Barry Wiss conducted a fascinating presentation comparing the regions of Napa Valley, CA with Bordeaux, France. It is astonishing that wine has been produced for only 150 years in Napa, and, despite many major setbacks during that time, including the Earthquake of 1908, two world wars, the Great Depression, Prohibition, and numerous severe droughts, Napa’s wines consistently rank among the best in the world. With 17 different AVAs within a relatively small valley, Napa is able to grow an impressive assortment of grapes, producing varietals of exceptional quality, including Cabernet Sauvignon, Merlot, and Sauvignon Blanc. The uniquely “Mediterranean” climate, affording a longer growing season with warm days and cool nights, combined with the fact that 50% of the world’s known soil types are found in the valley, result in a winemaker’s paradise. Bordeaux, by contrast, is eight times the size of Napa, and has produced wine for thousands of years, since the Roman Empire. Tried and true, its wines are of similar excellent quality, generally with less fruit forward and more mineral characteristics. We were able to sample this first hand, tasting a Merlot from both regions. Though the soil is not as diverse as Napa, Bordeaux produces a variety of wines also, including Medoc, Sauterne, Sauvignon Blanc, Cabernet Franc, and Cabernet Sauvignon. Speaking of wine, AMA has treated us to a different French red and white each evening at dinner. 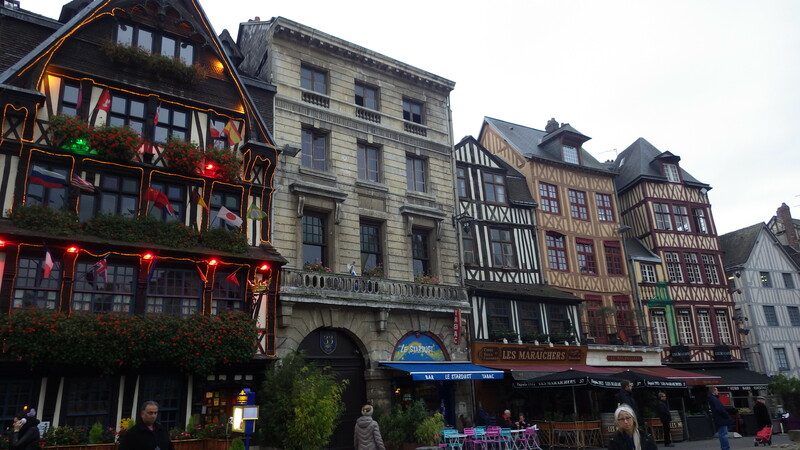 Today we have arrived at Caudebec-En-Caux and will take a bus to the charming seaside village of Honfleur. Be sure to check in with us tomorrow on the WineStyles blog, where you can hear it through our grapevine! 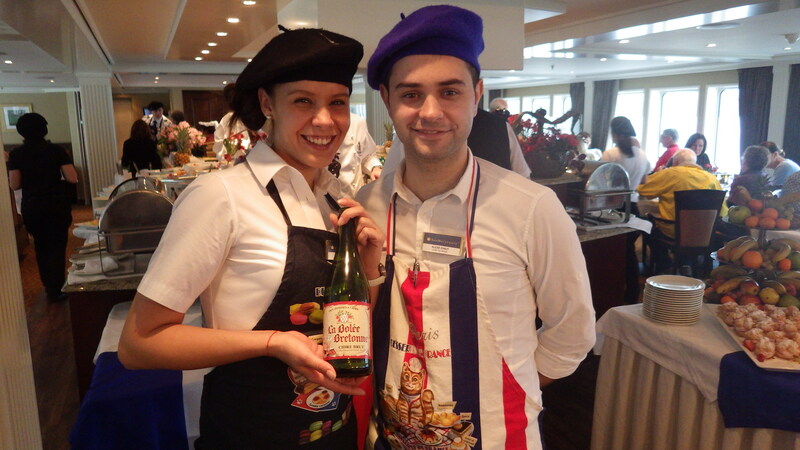 Bonjour to our WineStyles family! 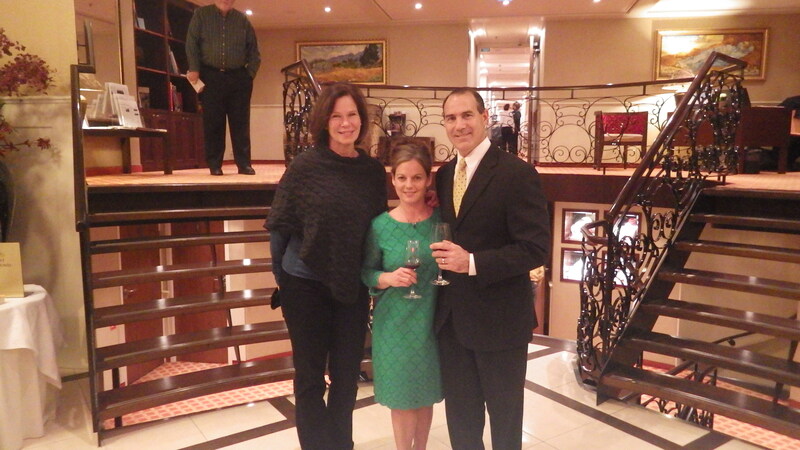 After a fabulous day and a half of eating, drinking, and sightseeing our way through the romantic city of Paris, we were warmly welcomed aboard the river cruise ship AMALegro. We checked in to our beautifully appointed stateroom, and, after meeting Captain Franck and his crew, dined with new friends, enjoying a 6-course welcome dinner including a salmon and crayfish appetizer, Normandy mussel soup, grilled fillet of butterfish and prawn with Pernod sauce and saffron risotto, and, of course, a glass or two of Beaujolais! 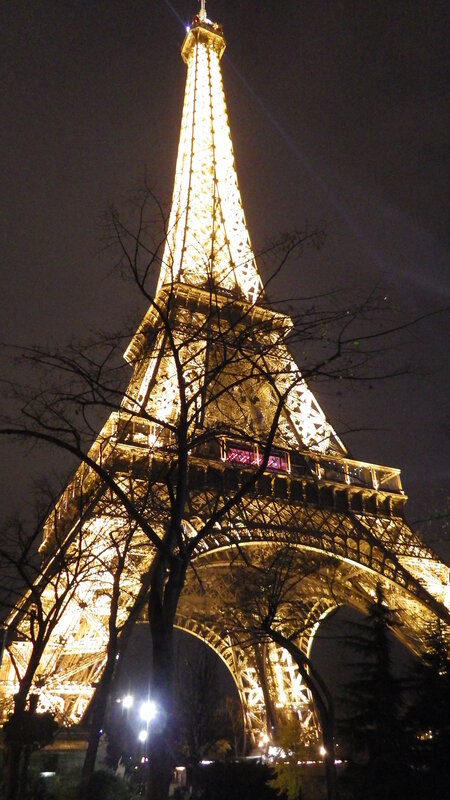 After dinner, the ship set sail on the Seine, pausing at the Eiffel Tower for us to watch a delightful light show, as thousands of bulbs affixed to the tower lit up the nighttime sky over Paris in synchronized splendor. 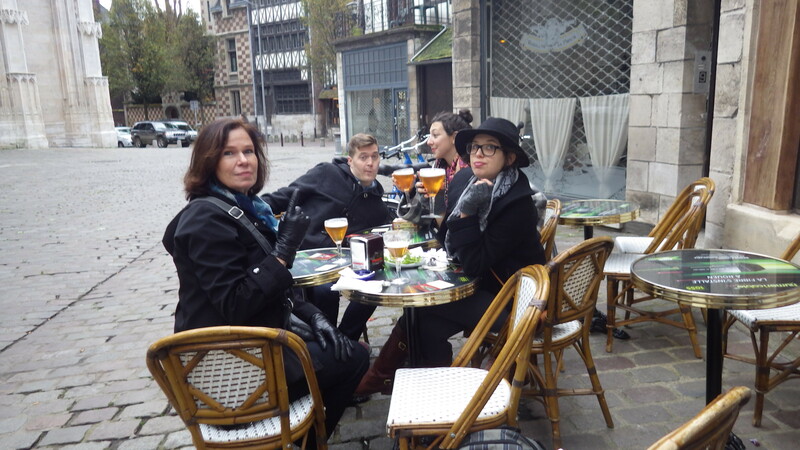 Despite a chill in the upper deck air, our hosts kept us warm with “vin chaud” (hot wine), roasted chestnuts, and their gracious hospitality. 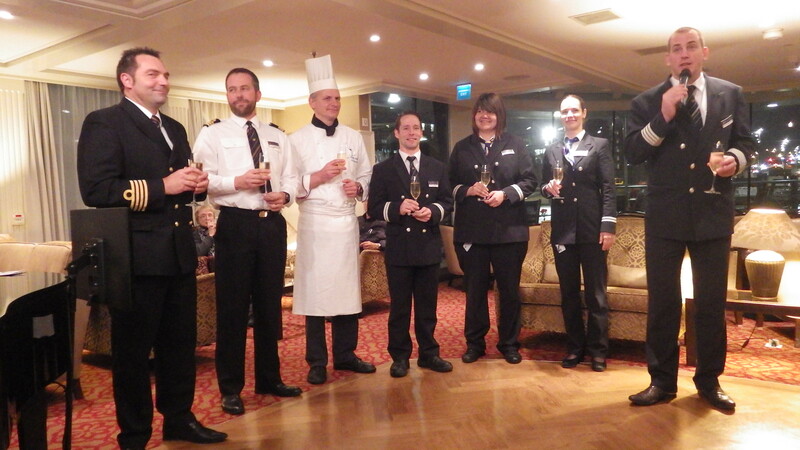 We ended the evening with a glass of Prosecco at the piano lounge, where we got to know the most important person on the ship besides the captain, our Bulgarian bartender Plamen! 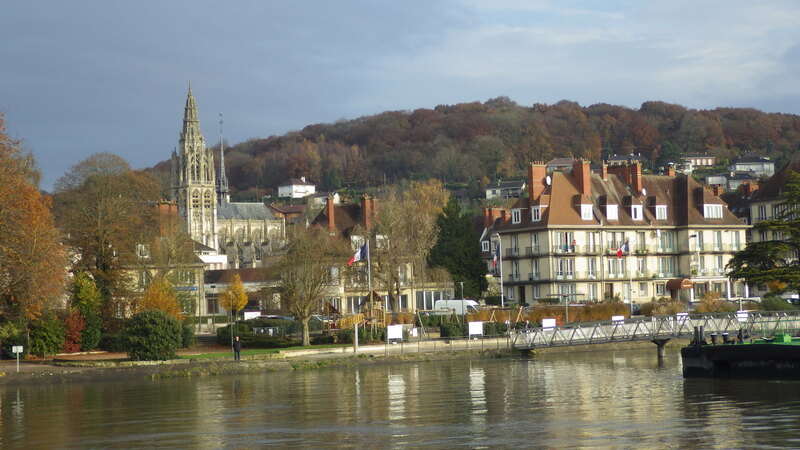 On Friday morning we found ourselves well into Normandy Provence, marveling at the precision with which our floating hotel was navigated through the narrow locks system on the Seine. 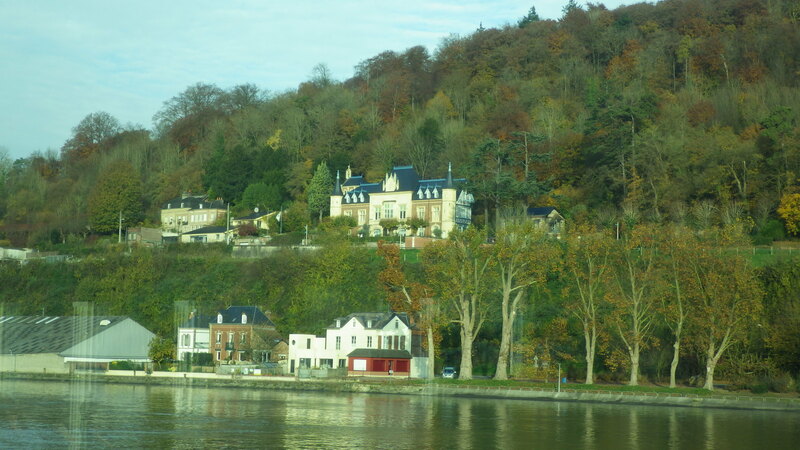 On river right, before arriving at Vernon, we viewed La Roche Guyot, complete with castle ruins and the stately residence which at one time served as the German General Rommel’s headquarters during the Nazi occupation of France. 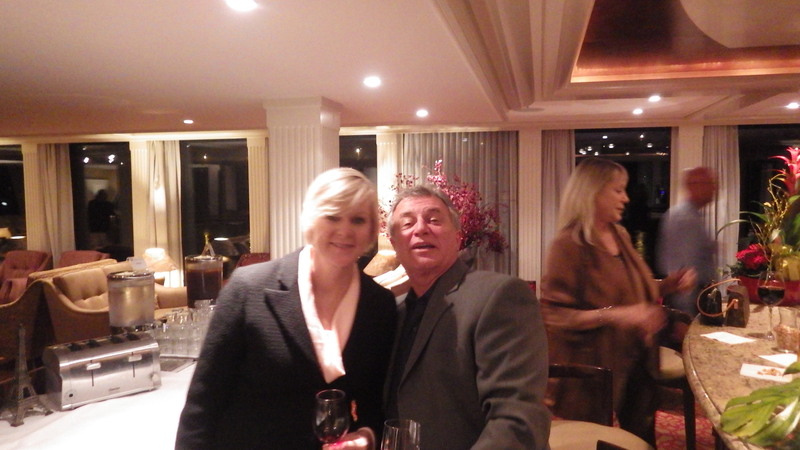 After a briefing from our Cruise Director John on the many exciting excursions planned for our journey on the Seine, we were treated to our first educational wine presentation from Barry Wiss, Vice President of Trade Relations for Trinchero Family Estates in Napa Valley, California. His opening topic addressed the important role aroma plays in the enjoyment of wine, and how to most effectively sniff and swirl in order to identify primary, secondary, and tertiary aromas. We got to practice on two very nice Napa selections, Gott un-oaked Chardonnay and Sea Glass Pinot Noir. Presently, we are off to visit Chateau Bizy in the riverfront village of Vernon, our first port of call. Few places in the world offer a better travel experience for wine lovers than a visit through California’s Napa Valley. The Napa Valley has become a global destination to experience some of the worlds finest wines, beautiful winery properties and gourmet fine dining restaurants. The Napa Valley (from South to North) comprises not only the town of Napa, but includes Yountsville, Oakville, Rutherford, St. Helena and Calistoga. Each town could represent an entire weeks exploration to experience the numerous wineries and restaurants of the area. 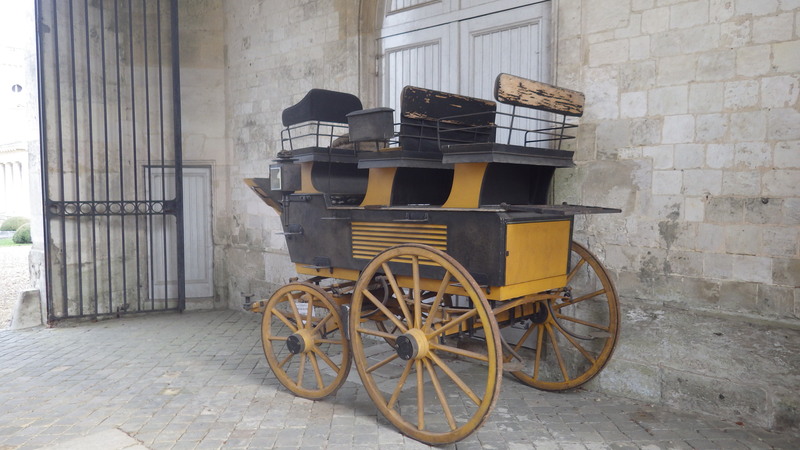 However, since most travelers will only have a few days to explore the valley we’ve assembled a collection of recommended stops in the sub-appellations in greater detail. First on our travel plans is a visit through beautiful St. Helena and Spring Mountain. One of Napa’s most iconic estates, Duckhorn Vineyards have been among the finest and most influential producers in Napa history. The Duckhorn name has become associated with quality wines crafted from Bordeaux varietals such as Sauvignon Blanc, Cabernet Sauvignon and Merlot. 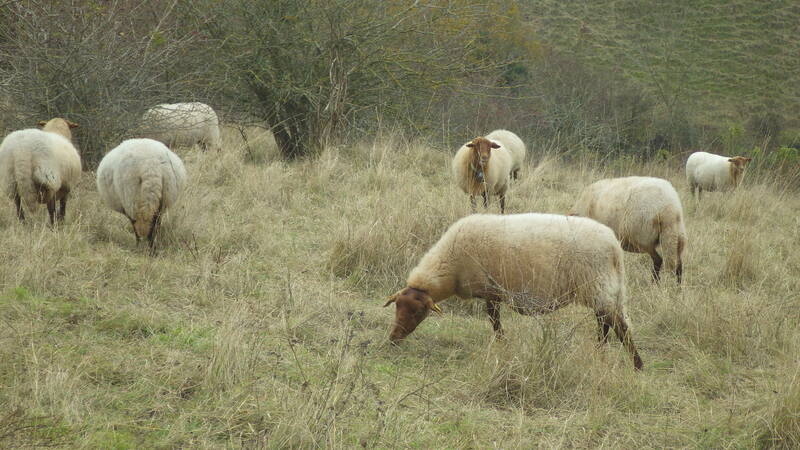 The estate is tucked away on the valley floor, in a tranquil and almost isolated setting. The line up of incredible wines, surrounding vineyards and amazing tasting experience make Duckhorn a must visit. The premium tour and tasting includes a collection of their single vineyard wines along with artisan cheese pairings for each of the wines. The charming Victorian setting of St. Clement Vineyards make it a great stop on your tour around St. Helena. 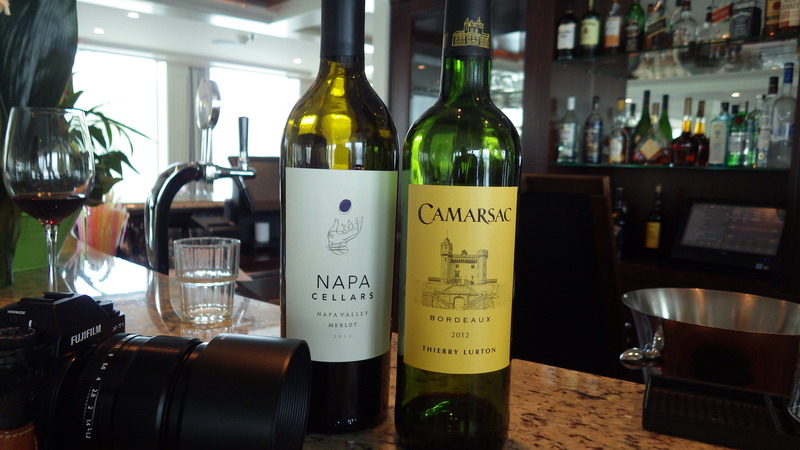 The winery produces a Sauvignon Blanc, Chardonnay, Merlot, Cabernet Sauvignon and their signature Orropas Blend. The wines of award-winning female winemaker Danielle Cyrot, demonstrate restrained power with the depth and strength that have made Napa Valley wines so popular, but with soft polished edges that also make the wines elegant and not over powering. Enjoy a tasting from the stone terrace or buy a glass of wine as you relax on the front porch of the winery. In order to properly experience St. Helena and Spring Mountain, it is important to make time to stop at a few smaller family owned wineries that produce outstanding wines. One of our favorites is Salvestrin Vineyard & Winery. A small farm-house style winery with a tasting bar and casually comfortable outdoor patio at the base of their vineyards provide a cozy setting to enjoy a collection of delicious wines. We recommend their single vineyard estate Sauvignon Blanc and Retaggio – blend of Sangiovese, Merlot, Cabernet Sauvignon and Cabernet Franc. This is the perfect stop if you’re looking for a place sit back, kick your feet up and enjoy a few glasses of great wine without pretense. Perched high a top Spring Mountain, Schweiger Family Vineyards provides a picturesque setting with sweeping views of St. Helena. To get to the winery you will have to navigate miles of winding roads as you climb your way up Spring Mountain Rd. Along the journey you will pass several famous Spring Mountain neighbors such as Pride, Terra Valentine and Barnett Vineyards. As you arrive at the winery a line up of handcrafted Chardonnay, Merlot, Cabernet Sauvignon and their Dedication (proprietary blend) reward you for your visit. Incredible wines served with an unforgettable view and family hospitality make Schweiger Vineyards one of our recommended stops in the area. Please share your experience and recommendations with us. We want to hear your stories and your suggestions in discovering new favorite wineries to visit for future adventures in the valley. Cheers! Sonoma is a great destination to enjoy a relaxing weekend in wine country. The good soils, temperate climate, and abundant food and water made Sonoma an ideal place for Spanish missionaries to settle in 1823. Nearly 200 years later, the land is filled with vineyards and people who remain true to the old town agrarian roots of the community. Where Napa offers luxury and at times indulgence, Sonoma delivers a home-style comfort and casual elegance that is relaxed and laid back. While there are dozens of great wineries and restaurants that you can visit, we’ve put together a suggested itinerary for a wonderful day in Sonoma visiting some of our favorite wineries and restaurants. Seeing as the wineries don’t open until 10 a.m. this should give you plenty of time to enjoy a big breakfast to start the day. We’ve planned a busy day for you, so we suggest having a good breakfast before heading out. Cline Cellars is a unique property with a casual farm house style tasting room. The estate specializes in Zinfandel and Rhone varietals such as Mourvedre, Carignane and Syrah. The property is also home to a California Missions Museum which houses a collection of models of all the historic Spanish Missions that helped settle the California coast from San Diego up through Sonoma. This stop is a wonderful, relaxing visit to start off your morning. Fred and Charlie Cline are great people and their love of the land and their warm and hospitable nature translates across their entire staff. Just down the road, Gloria Ferrer offers an outstanding selection of Chardonnay, Pinot Noir and Sparkling Wines from the Carneros. The picturesque terrace offers the perfect setting to enjoy the beauty of Sonoma. The Food & Wine pairing tour offers an educational tour through the property including information on wine making and sparkling wine production. Guests love the experience of touring the sparkling wine caves before heading to the terrace for a guided tasting of 4 food and wine pairings. There is a minimum of 6 guests required for the tour so smaller groups will want to call ahead to RSVP to check for availability. An Italian inspired atmosphere awaits you at the gorgeous Jacuzzi Family tasting room. The manicured vineyards and Italian villa architecture of the estate will captivate your senses with an experience that will make you feel like you’ve been transported to Italy. The winery specializes in California expressions of Italian grape varietals such as Arneis, Barbera, Nebbiolo, Pinot Grigio, Sangiovese as well as typical Carneros varietals of Chardonnay and Pinot Noir. 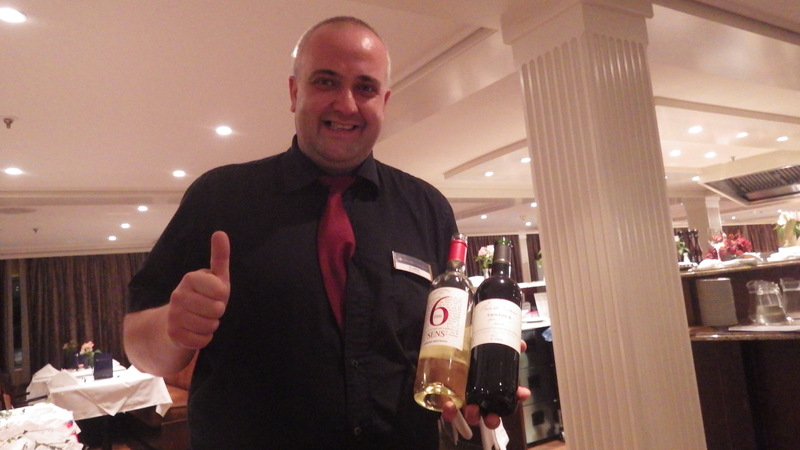 The best part is guests receive complimentary tastings of 5 wines. 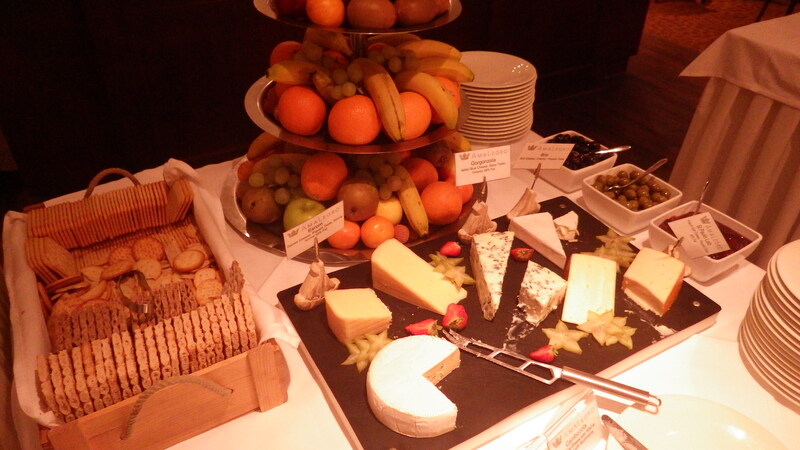 If you’re getting hungry gourmet cheese platters are also available for small groups with advanced reservations. Your last winery visit for the day will be a trip to Arrowood Vineyards to taste their famous lineup of Cabernet Sauvignon’s, Merlot, Malbec, Chardonnay and Viognier. These wines often come vary highly rated by a variety of wine critics and will be the perfect way to end an afternoon in Sonoma. From the veranda you can enjoy a glass of wine while looking out on the valley below and Sonoma Mountain in the landscape. We realize that your going to need to eat, so here are a few recommendations of our favorite spots in Sonoma Square for you to indulge your taste buds and find a variety of great cuisine to pair perfectly with your favorite wines that you purchased during your winery visits. California inspired country french cuisine. A menu full of fresh local ingredients, carefully executed dishes and of course… figs. 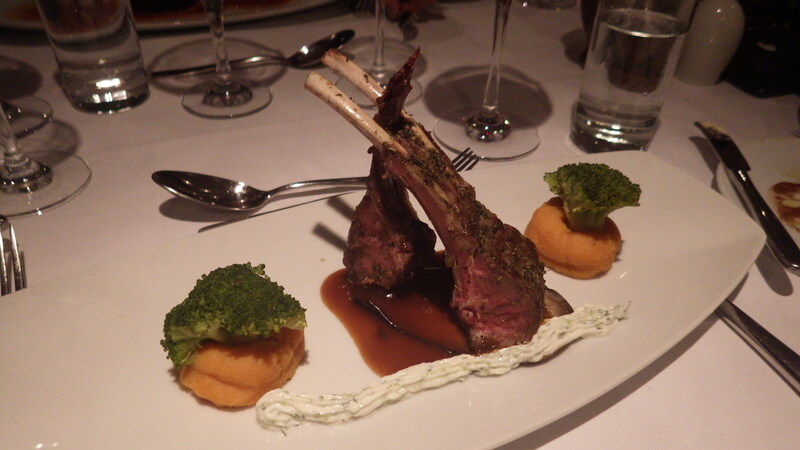 The dinner menu includes a 3 course tasting menu with wine pairings for only $40 per person. 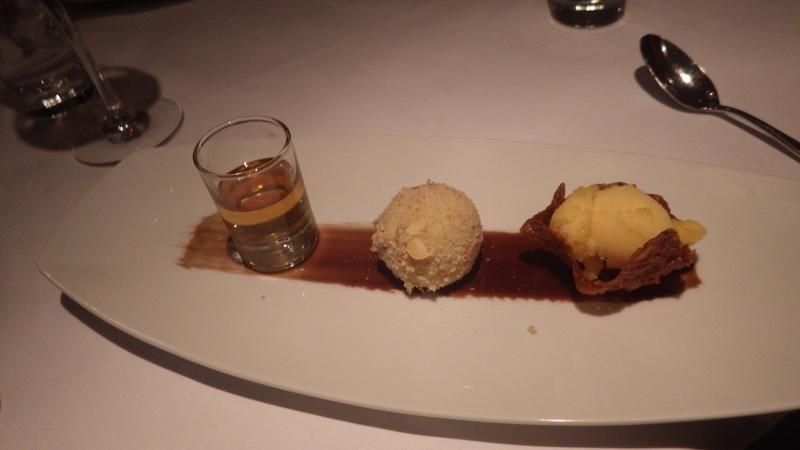 For the adventurous dinners, LaSalette delivers Portugese influenced tapas and regional Iberian cuisine. A perfect spot if your looking for a unique dining experience. To describe this restaurant in one word it would be “precise.” Everything from the simple, yet carefully crafted menu to the cozy, elegant and minimalist decor of the restaurant is well crafted. Make sure to get your reservations in advance as the restaurant is small and fills up quickly with locals…which is always a great sign. You won’t be disappointed.